Are you looking to reduce the cost of your advertising while getting more enquiries? Our event is aimed at helping small businesses achieve this. Many small businesses struggle to make their digital marketing work. We’ve identified that there are common mistakes that the majority of businesses are making in relation to how they use Google marketing platforms. 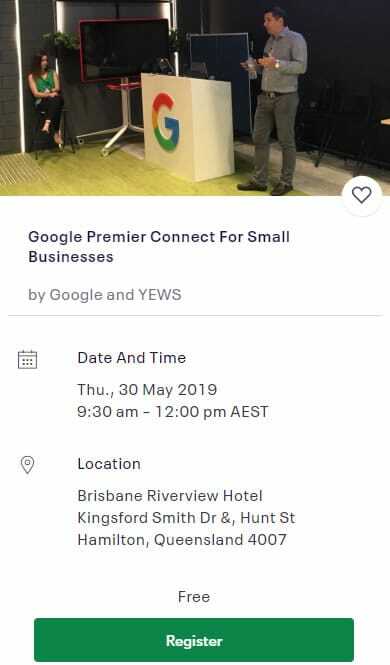 Your Easy Web Solutions and Google have put together this event with the objective to help small businesses with direction and strategy when it comes to digital marketing campaigns. From our observations, most small businesses either don’t do any marketing, or they market by trying to copy what other businesses do. This usually results in wasting time, poor results and high costs. Because of these reasons, we’ve decided to put together this event. Your Easy Web Solutions will be doing case studies on how they generate leads for clients for as low as $5 per lead. They will be covering their ACUA principle and how they use landing pages to achieve high conversion rates (over 20%). A: Google and Your Easy Web Solutions base their presentations on current strategies that work. A lot of the concepts are new and might be worth exploring for your business. A: At this stage, we’ve not planned for another event. There will be other events in the future on other topics and industries, please contact us if you wish to be notified.